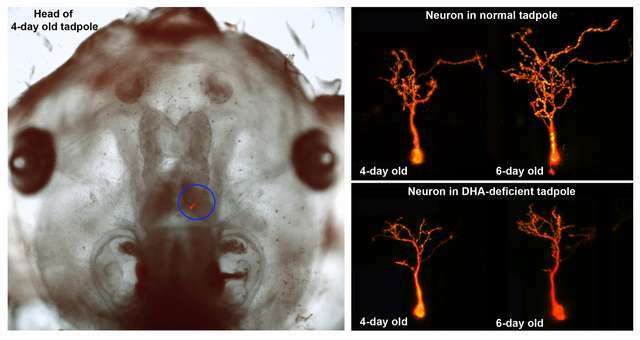 The Cohen-Cory study shows for the first time how deficits in certain fatty acids cause molecular changes in the developing brain that result in constrained growth of neurons and the synapses that connect them. Dietary DHA is mainly found in animal products: fish, eggs and meat. Oily fish - mackerel, herring, salmon, trout and sardines - are the richest dietary source, containing 10 to 100 times more DHA than nonmarine foods such as nuts, seeds, whole grains and dark green, leafy vegetables. Journal article excerpt: "... supplementation of maternal diets with DHA rich fish oil can reverse deficits in morphology and connectivity of central neurons within the developing tadpole brain therefore emphasizes the significant interactions between fatty acid metabolism and neurotrophic function and further underscores the importance of proper maternal nutrition during gestational age for proper brain development and function among all vertebrate species." Excerpt: "Whilst the view that nutritional conditions had a role in directing evolution seems contrary to the gene-centric view of evolution, it is consistent with pure Darwinism."